Elias Hughes - Licking County Library's Wiki! 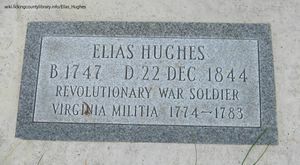 Gravestone of Elias Hughes, the first settler of Licking County. Known as the first settler of Licking County, Elias Hughes was born in Hardy County, Virginia around 1747. He served as a patriot during the American Revolution, present at the Battle of Point Pleasant in 1774, considered to be the first battle of the Revolutionary War. From 1774 to 1795 he served as a scout and spy along the frontier, warning settlers of Indian attacks. He first came through Licking County in 1796 while traveling as a scout, and came back in 1798 to settle the area himself. In 1802 when the first militia for the county was created, Hughes was elected captain, a post he served for many years. Hughes was married to Jane Sleeth. In 1799 Jane gave birth to their son Henry Hughes who was the first white child born in Licking County. The couple had 14 children, 12 of which grew to adulthood. The family moved to Newton Township in 1809. He volunteered to fight during the War of 1812 to defend Fort Meigs at Perrysburg, located near Toledo. Hughes died on December 22nd, 1844. He was buried in North Lawn Cemetery in Utica with full military honors. ↑ Fleming, D. (2009). Journey through 200 years: Vintage vignettes from Licking County, Ohio. Newark, Ohio: Licking County Bicentennial Commission ; Licking County Historical Society. This page was last modified on 1 November 2017, at 13:01.